The demanding resolution is taken care by the powerful Snapdragon S4 Pro chipset with a quad-core Krait processor and the new Adreno 320, which is the best an Android phone can get at the moment. But is the 2,020mAh battery too small? A big, high-resolution screen and powerful chipset are certainly battery-hungry, but the call test is unaffected by this. The Droid DNA lasted just over 11 hours, which puts it very near the top of our charts. It’s less than the 15 and a half hours the Optimus G managed with its 2,100mAh battery though (it uses the same S4 Pro, but runs on a GSM network instead of CDMA). Bringing the screen and processor into play takes its toll on the battery, but the HTC Droid DNA time of 6 hours and 40 minutes in our browser test is pretty good. It’s not record breaking, but it does beat the Optimus G by an hour and a half (note: tests are run on a Wi-Fi network, cell network type doesn’t matter here) and is a hair ahead of a Jelly Bean-running Galaxy S III. The HTC One X+ still is over an hour ahead though. 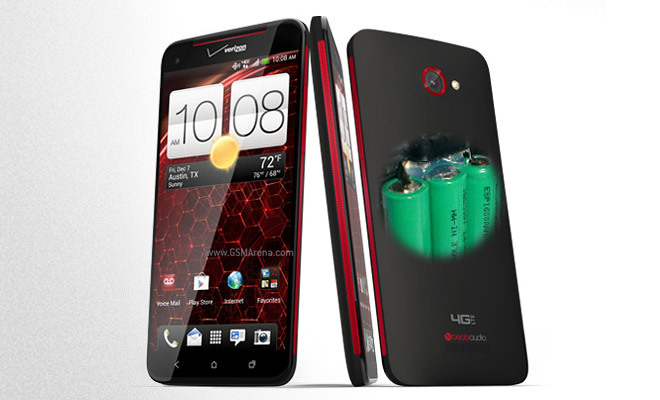 The HTC Droid DNA can play Full HD videos with no downscaling, which can be said about very few pocketable devices. Lasting for 7 and a half hours, the DNA placed in the upper half of our table, beating the LG Optimus G by a bit in the process. The bigger problem that the Droid DNA has is that it has only 11GB of user-available storage and that’s not enough for even 5 hours of quality Full HD footage. 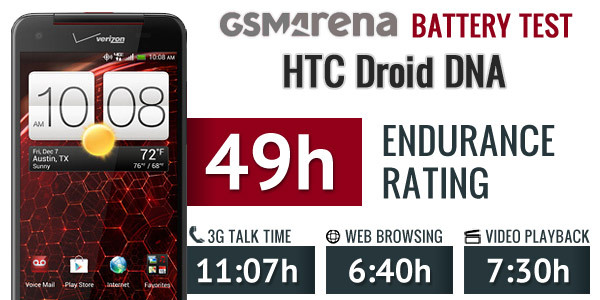 The HTC Droid DNA has pretty efficient standby, which helped it score an endurance rating of 49 hours (that’s the time between charges if you do an hour each of calling, browsing and watching videos). While we would have liked to see a bigger battery in a phone the size of the HTC Droid DNA, it turns out that 2,020mAh are quite enough to keep the beast going. Just keep in mind that taking advantage of that fast 4G LTE connectivity will add further strain on the battery.